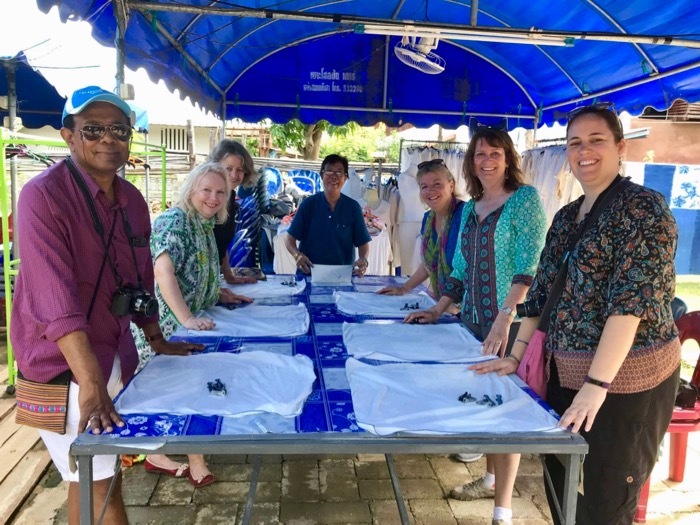 You are here: Home / Thailand / My Phrae, Thailand trip: Three temples, one indigo scarf and so much food! 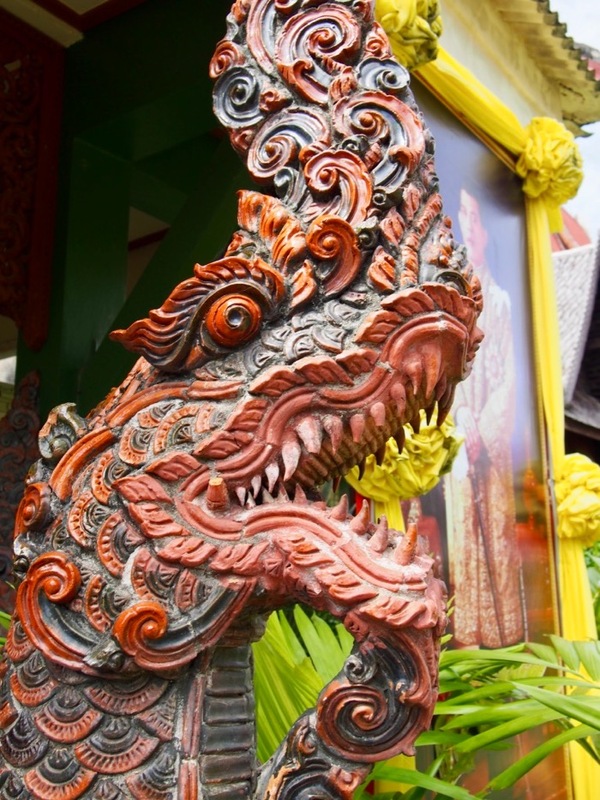 Heading to Thailand and want to visit somewhere a little different? This was only my second trip to Thailand but I was so excited to have the chance to go off the beaten path a bit, so I’ve got two recommendations for you in northern Thailand. First up: the town of Phrae (and it was followed up by Nan). It’s one of the oldest towns in the region with a fascinatingly long history and some great surprises. As I checked out of my hotel in Bangkok, the receptionist asked me where I was headed next. I tried to explain, but my pronunciation of Phrae (I now know it sounds more like “prayer”) was so bad he said he’d never heard of it! It’s certainly true that most foreign tourists (just like me until a month ago) have never heard of it; Phrae city is a small town of under 20,000 people, found in Phrae province (population around 450,000), east of Chiang Mai towards the Laos border. 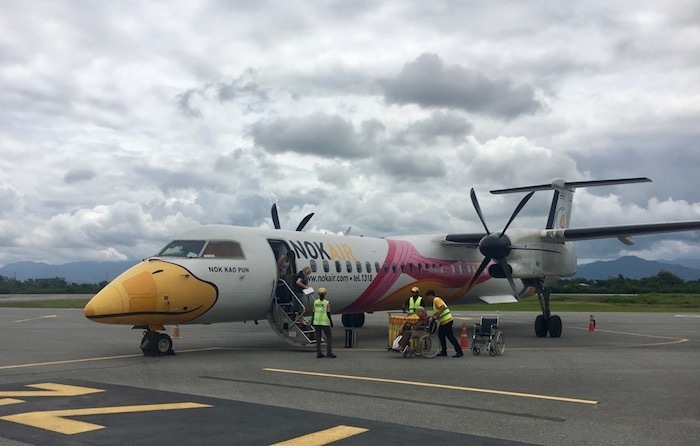 Bangkok to Phrae is over 550km; we took a Nok Air flight to get there (and let me tell you, my son is crazy-jealous that I flew in a plane which looked like a duck without him!). Chiang Mai to Phrae is relatively near – under 200km – and if you’re getting to Chiang Mai by bus or train, it’s not that hard to detour to Phrae. The beauty is that it’s not on the direct route so you won’t find many western tourists there at all – mostly only Thai tourists heading to Nan. So how did I end up in Phrae? Purely because of my love of unknown places! I was offered a choice of trips across Thailand after the Australian Society of Travel Writers convention in Bangkok and it was an easy decision to make my first choice somewhere I hadn’t heard of. For its tiny size there are actually lots of things to do in Phrae, but a lot of these boil down to: visit a temple. Fortunately, I’m kind of obsessed with temples and during my short stay in Phrae I got to visit three of them. First stop in Phrae was Wat Chom Sawam, a wooden temple (teak wood is rampant here in the north – it grows in the jungle) built in a Burmese architectural style. 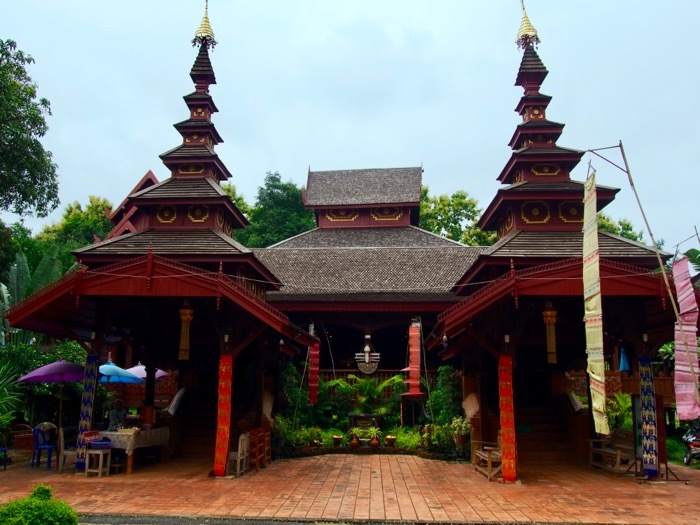 Wat Chom Sawam – look at all that teak wood! Inside it’s a combo of wood and shine – it’s not much over a hundred years old so looked in great condition compared to some of the other temples I got to see in northern Thailand. 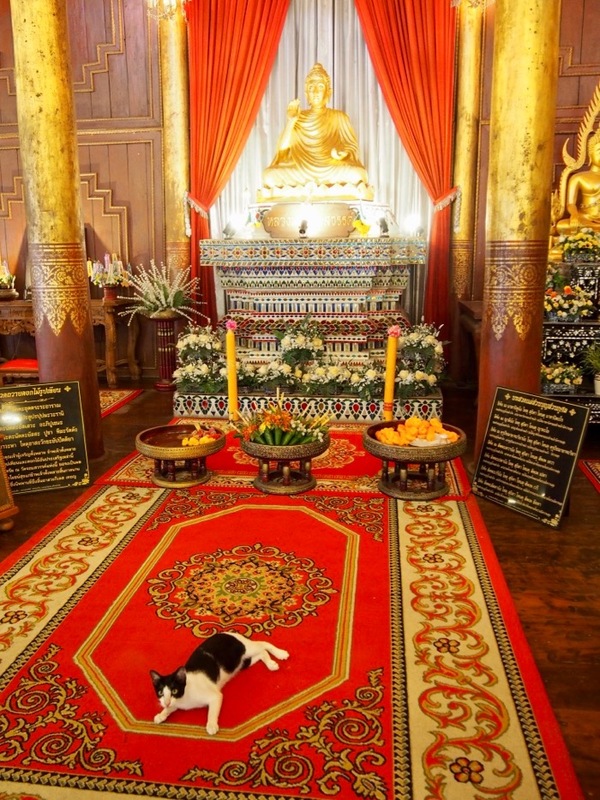 Super-pretty but my highlight, being the crazy cat lady I am, was seeing the first temple cat of my visit. Later that day we got to visit Wat Luang, the oldest temple in the area – they think it dates back to the ninth century (there aren’t many written records to date historical stuff in Thailand, so it’s a best guess, apparently). But if that’s right, then it was built at the same time as the town of Phrae itself was established, and that makes it pretty important. It was also pretty gorgeous! My favourite Phrae temple was our third one: Wat Pong Sunan. It was so vibrant and varied, and best of all, our timing was amazing and we bumped into an abbot who was very happy to stop and chat with us. 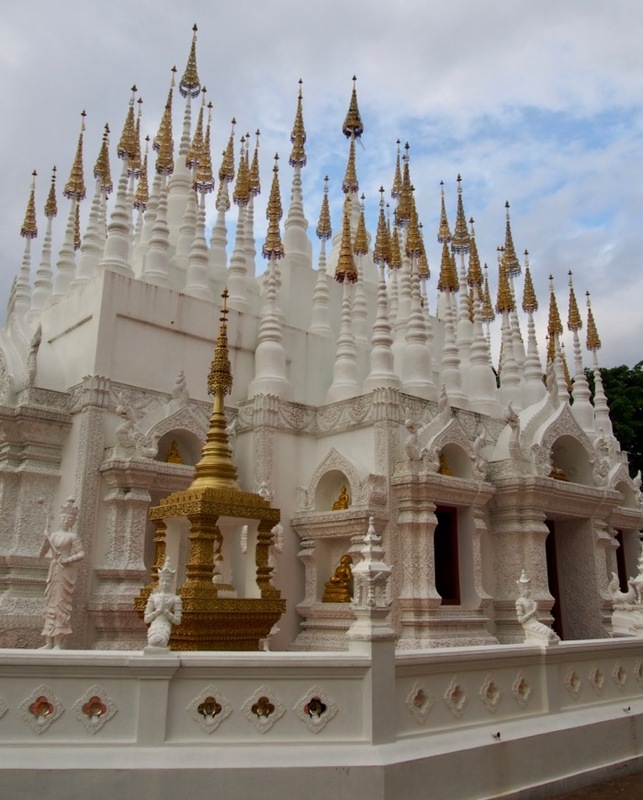 I learnt a little about the significance of the number 108 in Buddhism – Wat Pong Sunan has a section with 108 spires – though it’s kind of complicated. We also met two novice monks, aged 15 and 16, and I learnt that boys could start their journey towards becoming a monk at age seven – younger even than my own son – I couldn’t imagine it! Anyway, this entire temple complex was gorgeous inside and out, and I could have spent hours there exploring. 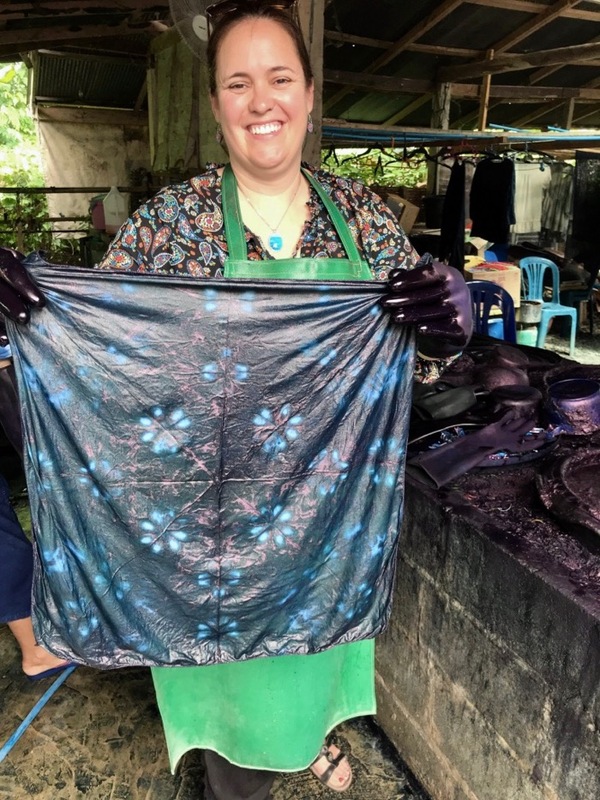 Apart from temple-visiting, it was fascinating to be taken along to the village of Ban Thung Hong, a quick drive from Phrae, where we learnt all about the process of creating indigo dye and using it on fabric. It had never occurred to me that it would come from a very boring looking plant (but one that’s native to the area – hence all the indigo clothing you’ll see). We were able to pick the pattern we’d like to dye into our small white scarf and about half of us ambitiously chose a flowery pattern. Of course it was the hardest one and I’m sure none of the group will be offended if I make the blanket statement that we were all pretty average at it. But – we had a lot of fun! Even though I’m not at all talented in this kind of task, I really love the chance to do something hands on and it’s also a good way to get a little more behind-the-scenes of a sightseeing attraction – better than just coming in to the village and browsing the shops. Ta-da! My indigo efforts. Fun (but hot and humid!) work. Although the shops are useful too! At the front of this space was a shop with really lovely clothing using indigo – many of us bought something (or things!) 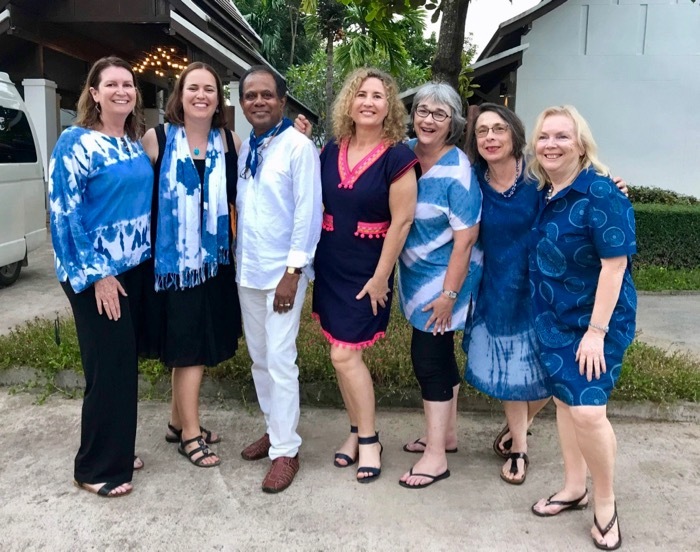 and we had an indigo night wearing our new purchases for our final dinner together. Thai food is awesome. Sometimes I find some of it too spicy, but when it’s not, the flavours are amazing and throughout this whole trip I was served meal after meal of amazingly fresh tastes and produce. In fact it’s going to be hard for me to write this section because it’s making the Thai food cravings much stronger! But let me push through and tell you about my favourite meal in Phrae. 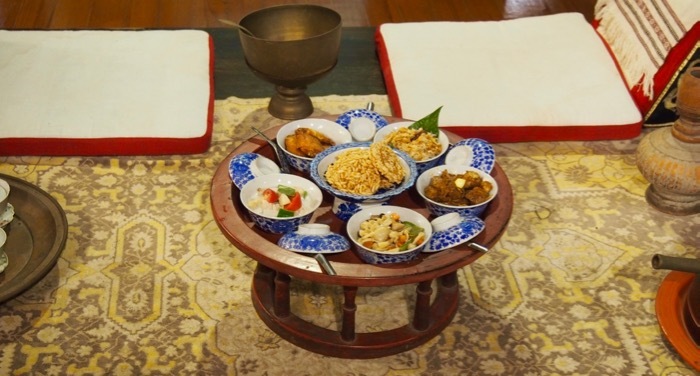 There are a number of old mansions here (built of teak, of course) and we went along to the Wongburi House (or Ban Vonguri) for a tour of the gorgeous home and then dinner – Khan Toke style. This means we sat on the floor around these low basket-like tables filled with incredibly delicious northern Thai dishes. 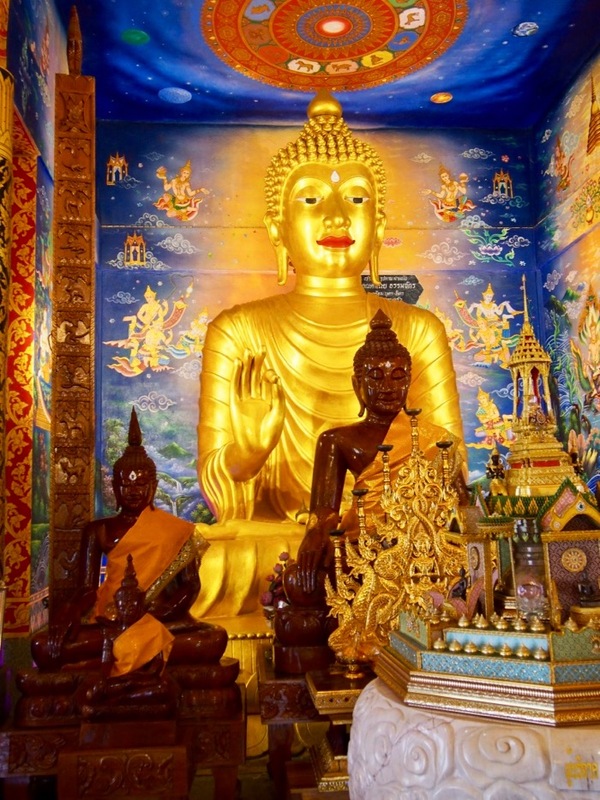 So, should you visit Phrae in Thailand? I didn’t quite know what to expect from Phrae but having been there I can only heartily recommend it. There are very few foreign visitors (so you would want to have a good translation app at the ready, I think) but that’s also the beauty of it – for me, there’s nothing better than going for days without seeing any other foreigners. Apparently it’s reasonably popular for Thai tourists and that means there is decent tourist infrastructure, including quite a few accommodation choices. 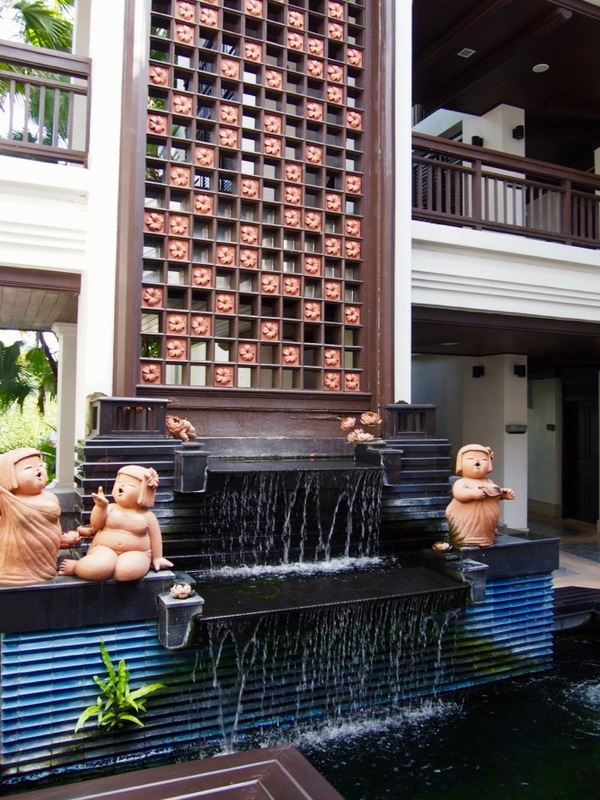 We stayed at the delightful Huern na na Boutique Hotel in Phrae – it was gorgeous and notably the only place in Thailand I had the chance to have a swim to escape the humidity and the pool was beautiful! Questions? Ask away in the comments. 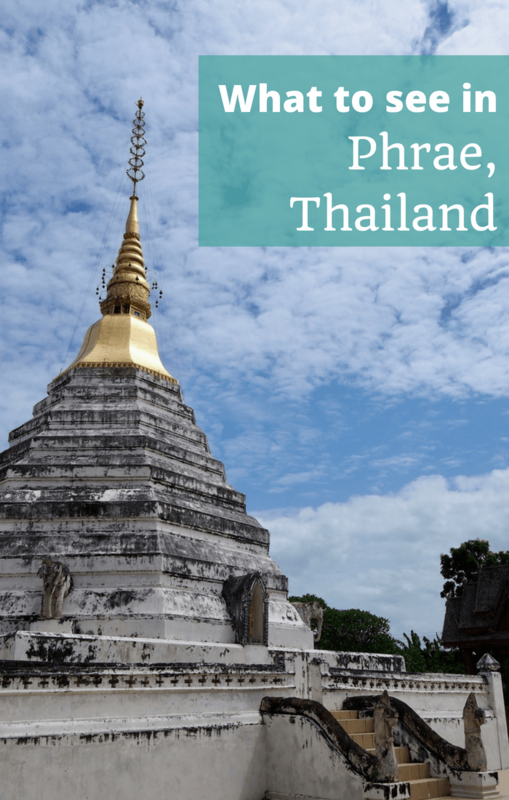 I have so much to say about Phrae … now that I can more-or-less pronounce it!